Two gay college students were outed on Facebook because of a privacy flaw in Facebook Groups. 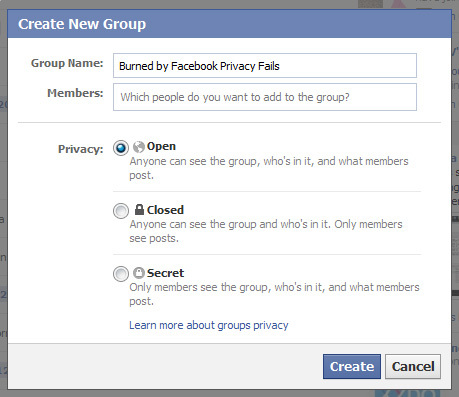 Users can be added to Facebook Groups by friends without the user’s permission or approval. If you happen to be added to a Group that you don’t want to be associated with, then your only option is to leave. This is obviously not an effective privacy control, as shown in the scenario below. The problem here isn’t educating users about often cumbersome privacy controls – the problem is that the privacy controls regarding this issue with Facebook Groups is fundamentally flawed. Even if you were to educate all Facebook members that anyone can be added to a public group, what is to stop situations like this from occurring? It’s outrageous for Facebook to blame the lack of user education in this instance! All condolences are too little, too late for these two students, who have faced angry reactions from their families.